In December 2014 the Religious Freedom Project, in partnership with Baylor University’s Institute for Studies of Religion, assembled scholars, experts, and activists for a thorough examination of the challenges to religious freedom faced by Muslim minorities around the world. Speakers addressed questions such as: How has the persecution of Muslims minorities affected their well-being in Europe and North America, the overall health of Muslim-majority nations, and the growth of violent Islamist extremism? This day-long conference, entitled “Muslim Minorities and Religious Freedom: A Public Dialogue,” comprised four enlightening panel discussions. 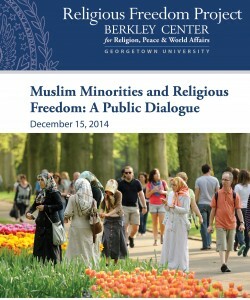 This conference explored the effects of the marginalization of Muslim minorities in Europe and North America. It also addressed how Muslim communities can contribute to religious freedom, stable democracy, economic growth, and the countering of violent religious extremism. It featured three panels of experts, among them Abdullah Saeed, Dan Philpott, Jocelyne Cesari, and Timur Kuran, as well as a keynote conversation between Professor Robert P. George of Princeton, Professor John Esposito of Georgetown, and Shaykh Hamza Yusuf of Zaytuna College. The event attracted an audience of several hundred scholars, journalists, religious leaders, and other members of the public.